Race day dawned and the weather was very un-Spanish – there had been thunder and lighting during the night and it had been raining heavily. We had been watching the forecast for over a week, praying that it would stay dry. Unfortunately, our prayers would be in vain. As we walked from our apartment to the start, the rain continued falling and the race PA was giving constant warnings to take care out on the bike course. I’d been up since 5.00am to eat my regular race day breakfast of porridge with honey & dates, toast and a bottle of Mountain Fuel Extreme Energy drink. All the time I could hear the rain beating down along with an occasional rumble of thunder. My target was to complete the race in under 12 hours and I also had a target time for each leg. But arriving at the start and seeing the sea; my heart sank. The day before I had done a swim course reccie with Adrian (Hine) and Dan (Gould) and we had a fabulous swim. The sky was blue and sunny, the water was calm and very clear, almost like swimming in a pool, you could see 2-3 metres ahead. This morning the sky was dark, as was the sea, but it was also really rough with large waves breaking on the shore. This was a bit of a nightmare as I was worried about the size of the waves and the possibility of the swim taking much longer than I hoped – if I got through it all. We had racked our bikes in transition on Saturday along with our changing bags in the transition tent containing all our kit for the biking and running legs. 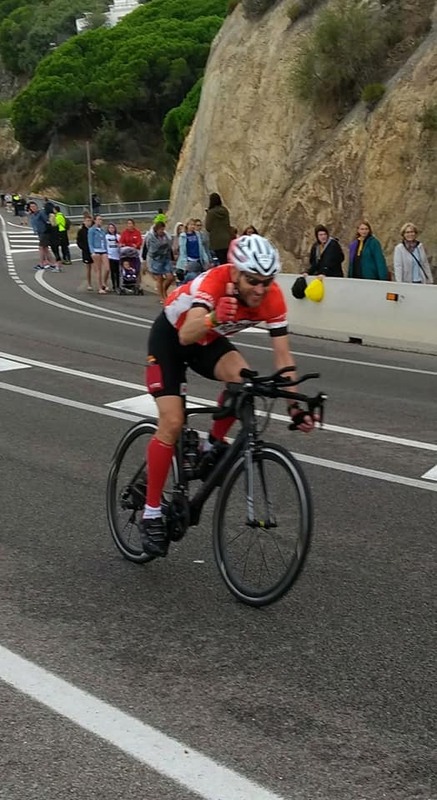 Arriving at the start I checked my bike was ok – tyres still hard and gears working – slotted my 2 drinks bottles in the holders, and packed my top tube bag with my “buffet” (banana, date & jam sandwich quarters, flap jacks and malt loaf). Then into the massive transition marquee to check my bags were still in place and make a final plan to find my way down the correct aisle. Then it was time for a final loo stop, don my wetsuit and make my way onto the beach just as it was becoming light. The rain had stopped but the hoped-for spectacular sunrise was just grey and very watery. The swim start was seeded with athletes choosing their anticipated time and joining a pen on the beach. These then filtered through a queuing system (a bit like a theme park ride) until you reach the edge of the sea under a huge inflatable arch where there were 6 funnels with marshals releasing 6 swimmers into the water every 5 seconds. Standing on the beach I moved into the 1hr 30 min pen. The atmosphere was electric – surrounded by thousands of other athletes and inspiring music blasting out of the PA. I watched as the pros set off and then the first of the masses. The waves were knocking people back towards the beach as they charged into the sea and loads, once they got past the initial breaks, were being swept off course and having to be guided back inside the line of the buoys by marshals on jet skis and canoes. Choosing the 1 hr 30 pen meant I had plenty of time to go through all sorts of emotions while slowly moving towards to the start, trying to work out a strategy from watching others going into the sea. In the end it didn’t seem to make too much difference which side of the start funnel or whether you walked or ran in – the waves were huge. The only worthwhile tactic I could see was once you were past the breaking waves to keep in the middle of the channel of buoys to avoid being carried too far off course. I walked into the water and took the impact of a couple of waves before ducking under the next one and swimming hard to get out past the roughest water. I don’t recall the water feeling cold at all. The main sensation was the swell, feeling like some weird roller coaster ride. At times I was on the top of a wave then I’d plummet down what felt like several feet, and my arm would be in mid air instead of catching the water for the next stroke. One of my fears in such a big race was fighting for space and being bumped or swum over by other athletes. The rolling start is designed to minimise this; and other than a few clashes, mainly turning around buoys, there were no real issues. Navigation in the swim is key – you don’t want to swim any further than you need to! Sighting the buoys was a struggle as the waves were like hills blocking your view. The course was in the shape of a long “L” and I managed ok other than top of the “L” where you swam back towards the beach for 200m before turning right and following the course back towards the start, parallel to the beach. I thought I was doing well and I was enjoying that I was over half way through the swim, when I was suddenly aware of a jet ski close on my left-hand side. Snatching a quick look up I saw the marshal gesticulating wildly and pointing back out to sea. With the large waves coming into the beach, I (and lots of others) had been pushed quite some way off course. I stopped for a few seconds to try and pick out the next buoy which was diagonally to my right and tried not to push too hard while aiming to get gradually back on line. 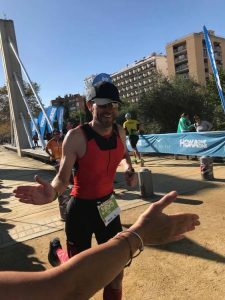 The last part of the swim was quite good fun – knowing I was almost finished, heading into the beach and swimming with the waves coming in from behind was giving a bit more momentum. As I got close too the beach I managed to catch a wave and body surfed a few feet before trying to stand up, only to be knocked down by a following wave….. twice! Eventually I was hauled up by two beach marshals and ran out of the water before reminding myself I should walk through transition to save energy and adapt to being upright. I looked and my watch and was amazed to see I’d completed the swim in 1 hr 14 mins. This gave me a huge boost – first leg done and I was 15 minutes ahead of schedule. I found my way to my place in transition, pulling off my wet suit and putting my bike gear on. Normally in transition I’d take around a minute or two. With 112 miles ahead, I took time to ensure I was comfortable, putting on socks and a bike top, which I wouldn’t usually do; and stuffing pockets with some Mountain Fuel jellys as back up to the other nutrition already stowed on the bike. My plan for the bike leg was to try and pace it carefully to come in around 6 hours, feeling I could maintain the required 18 mph average and still leave something in the tank for the run. The bike would also be the opportunity to fuel up, while maintaining the target pace, to avoid “bonking”. As I set out it was dry, but the roads were still wet from earlier rain and I made a mental note not to take any risks at turns or bends. Fortunately, the roads were closed to traffic for the entire 2 lap course. The weather changed several times during my time on the bike, from bright warm sun to pouring rain. I had an uneventful time but saw the aftermath of 2 crashes and also heard shouting and the crunching of carbon as a collision happened right behind me crossing a roundabout. The bike course was fairly flat, apart from a very long gradual hill in the middle of each lap. I realised quite early on that I was comfortably maintaining 19/20 mph, putting me ahead of schedule. A couple of sightings of Dan and Adrian during the bike leg raised spirits as we managed to shout at each other passing in opposite directions. Dan in particular was looking really strong on the bike. I’m sure he was smiling broadly each time I saw him – with good reason as his bike time was superb! At the end of the first lap you turn at a roundabout and head back out up a hill. The crowds at this point were phenomenal. Think Tour de France mountain stage! Flags, cheering, horns and cow bells. I decided to take the second lap at a steady pace and not push too hard, knowing I had some time in hand and hopefully conserving energy for the run. I’d also begun to feel a worrying, dull ache just behind my right knee and it got more intense as the second lap went on. I tried to push down more with my left leg on each pedal stroke, thinking I could protect the right leg for the run. I also increased the regularity of eating, knowing the opportunity to take on solid fuel was now down to less than 3 hours. I consumed the last of my foil wrapped banana sandwiches, a malt loaf bar, small flapjack and a banana from one of the aid stations on the course along with the remainder of the Mountain Fuel drink I was carrying in my bike bottles. 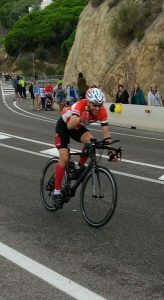 Coming into the final 3k of the bike route, which goes along narrow, speed bump lined roads, I passed Helen, Ella and the rest of our support crew – what a noise! On this section riders are not allowed to use aero bars due to the bumps and width of the road, so it was a little less frenetic and a chance to ease down on pedalling and stretch my calves by dropping alternate heels down on the pedals. On the approach to the dismount line I was hoping the pain behind my right knee was cycle specific and wasn’t going to prevent me from running. 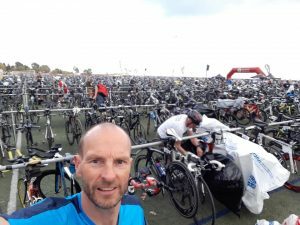 Into the giant transition area (a full size artificial grass football pitch) and I managed to rack my bike before diving into a portaloo – 6 hours on the bike without a stop – I was desperate for a pee! Then into the transition marquee to swap bike shoes for running shoes with a fresh pair of socks, cap and then I realised I’d made a schoolboy error, my garmin watch was still sitting on my bike. Without it I’d have no idea of pace, distance etc on the run. The watch face is detachable and I’d placed it on a bike mount on my handle bars so I could easily see speed, distance etc. as I rode. I should have unclipped it as I racked my bike and clipped it back on the wrist strap – the watch is Tri specific and designed to be able to do this easily, taking a matter of seconds….. provided the user remembers! 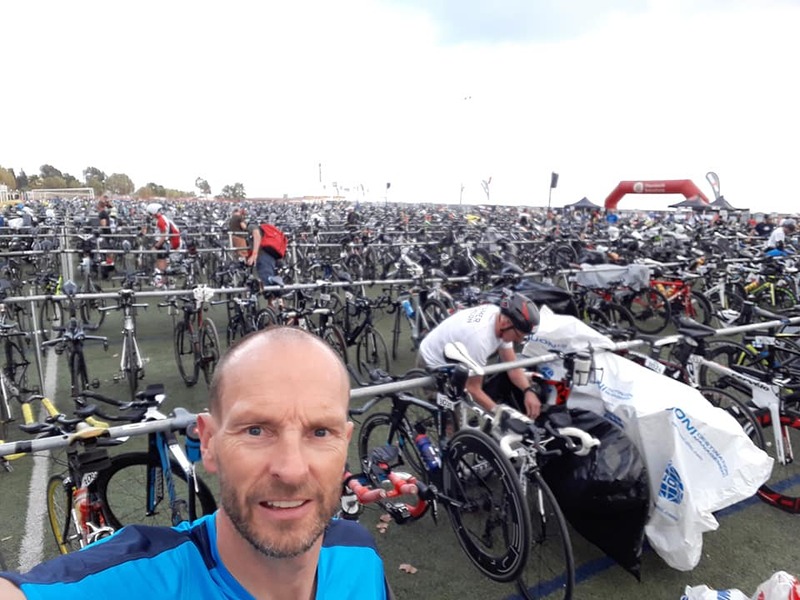 I had to go back out to the racking area, ducking under rows and rows of bikes to get to mine, quickly grabbing the watch before heading back the way I had come and then through the marquee to the run exit. I was frustrated I’d wasted time (probably only a minute or so) and I was cursing my error, but the distraction helped me ease into to the start of run and it wasn’t until my watch bleeped to indicate I’d hit the first mile that I realised I had no pain behind my knee…. This was a big relief. The run course was 4 laps which was great for spectators to see their loved ones passing a number of times. The feeling approaching the point where our supporters were based was amazing. They were less than a mile from the end of the lap towards the finish. We passed them twice on each lap in quick succession, taking the opportunity to high five, smile and enjoy the roar of encouragement. 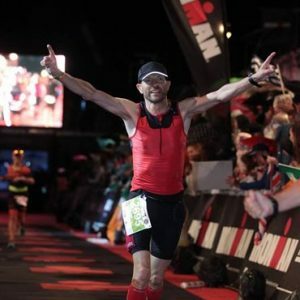 My plan was to start very easy on the run, allowing my legs to adapt from the constant pedalling and then hope to maintain around 9 – 10 minute mile pace for as long as possible. However, even early on it became a matter of just keep moving. Running is my strongest of the three triathlon disciplines and is where I usually make up places on the better swimmers and cyclists in the field. 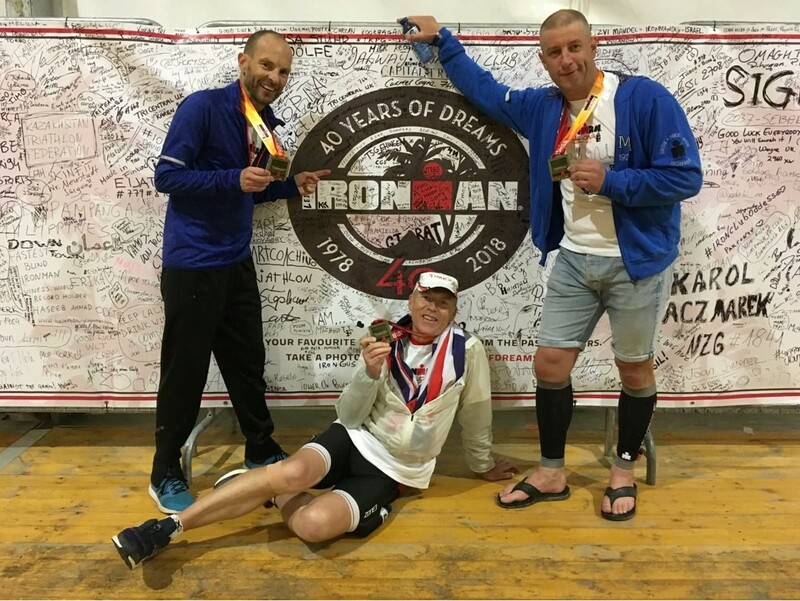 But I’d never run a marathon after a 112 miles biking before! 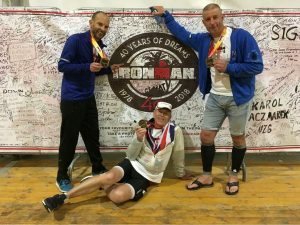 My legs felt heavy and I was conscious I wasn’t lifting my feet too far from the ground – the notorious “Ironman shuffle” I’d read about. This is where it became a real mental challenge. Looking back, it’s fascinating how I went through highs and lows (often within seconds/minutes of each other) and the conversations I had with myself during the run. 5 miles in and the voice in my head was saying “This is tough, don’t think I can do this. I’ve still got more than 20 miles to go” I countered with “You haven’t come this far to stop now. Keep moving” There were aid stations on the course giving out water, isotonic drinks, gels, slices of orange and flat cola. I was carrying my own Mountain Fuel Jellys, using some with caffeine, and walked through the aid station to take on water at about 9 miles. I made an agreement with myself then “ Run to half way (13.1 miles) then you can walk for a minute” The next 4 miles felt tortuous. I was shouting in my head “think of form, keep strong, use your arms” At the half way point I walked, looking at my watch to ensure it was no longer than 60 seconds, before breaking back into the shuffle that had become my running style. 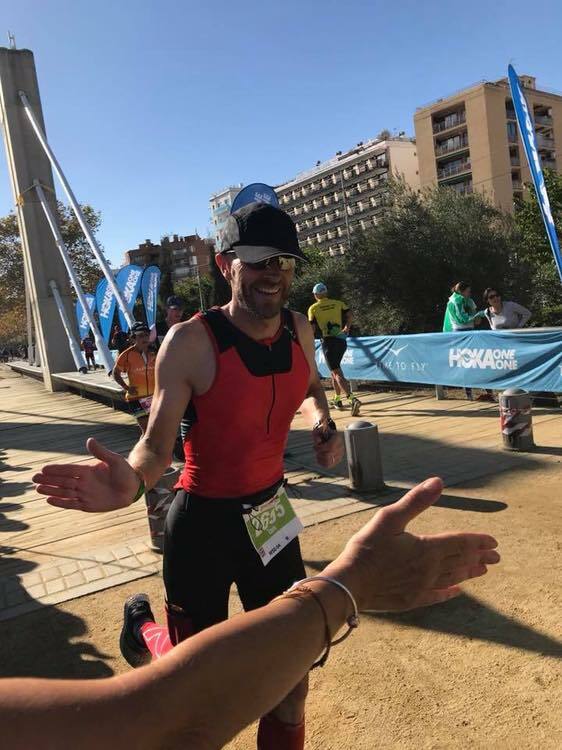 I wanted to tell Helen this was what I planned to do – but as I approached them I saw and heard our supporters getting a tremendous boost – last lap!! One part of the run course was brutally challenging – a very long straight road, alongside a railway track, that led to the furthest point of each lap where you turned at a roundabout to head back along the same road. We did this 4 times and there were no spectators, as it was so far from the finish. The road seemed to go for ever, getting longer on each lap. On the final lap it was dark, pitch dark with only an occasional floodlight. My abiding memory is how quiet it was on that last lap. There were hundreds of runners passing both ways, it was raining hard, but it was silent, other than the intermittent splash of a foot in a puddle. Every one locked in their own psychological battle with themselves. It was here I developed the tactic of counting my steps “Every step takes you closer to the finish” and I started counting in blocks of ten. 23 miles done and the infamous “just a parkrun to go” pops into my head. Still counting I go up a slope with 2 miles left, that follow the beach, past the transition area and swim start that seems so long ago. Those 2 miles are a bit hazy. It was pouring with rain and the repetitive counting to 10 was lodged in my head. I was passing other athletes, the pain had disappeared and I felt like I was running properly for the first time all day. Into last 100 metres and I spotted Helen and Ella as I passed on the right hand side at the front of the grandstand. They were soaked to the skin but screaming loudly, I just saw them in time to wave and smile with relief. A fabulous read , heartfelt,emotional and inspiring . Great read Ian, your excellent prose describes in brilliant detail the pain and anguish you (and Dan/Adrian) must have endured on that day, brilliant achievement and one I could only but aspire too – I would have turned turtle when presented with the rough sea! I was gripped from start to finish. What a great read. I am in awe at you getting to the start line let alone the finish line. Inspirational. Ian, Well done YOU doesn’t begin to cover it. What an incredible tale. I keep looking at your times in amazement. Congratulations! !